How to Restrict a Network User to Be Able to Create a Project/groups? /Discussion Groups /Projects & Tasks /How to Restrict a Network User to Be Able to Create a Project/groups? A Network Admin might like to have only limited number of Projects/Groups in a given scenario by restricting network users to be able to create projects/groups. This way, only a Network Admin or a Network User with permissions would be able to create a new project/group. In the settings window, click the drop down to select who can create a project. 1. Any Network User – A network user part of the domain would be able to add a new project/group. 2. Only Network Admins – All the Network Admins would be able to create projects/groups. 3. 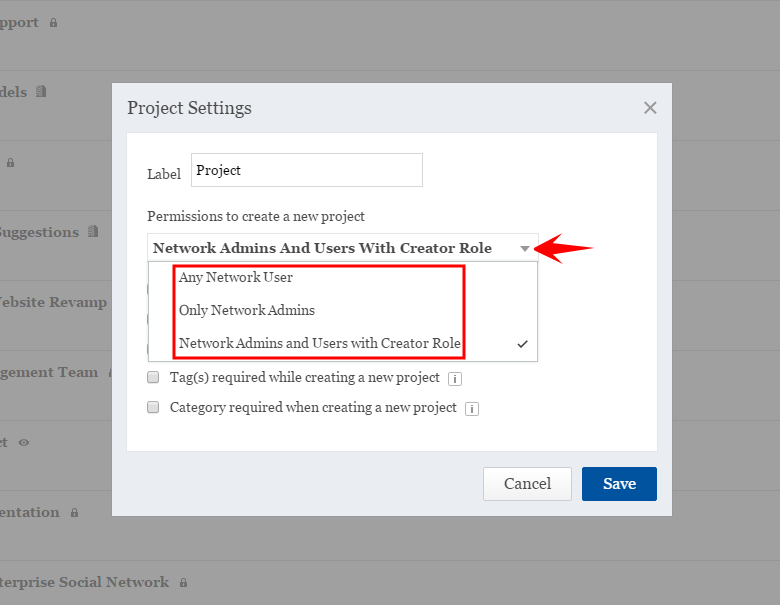 Network Admins and Users with Creator Role – All the Network admins along with specific users who have been given permission would be able to create projects/groups.